These boots look as cool and unusual in person as they do in photos. They have a western flair. They seem to be well made however they are a bit tight width wise. Still they are priced very reasonably. 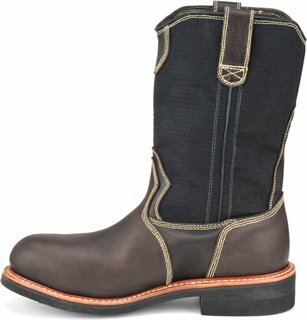 These are beautiful boots and seem well made. The price is so reasonable. They look cool. They are a bit snug on me so that’s a concern but I still think they are a great deal! Came the next day. I have been wanting to try work boots like these, i love my cowboy boots. Feel great, fut great. Glad i bought them. I work in an industrial environment as a welder. I like the wellington style boots because i do not burn up my laces with sparks!!! These Carolina ranch wellington boots surpassed my expectations for the price I paid. Excellent quality, craftsmanship, and price. the only complaint I have is the safety toe. I generally do not buy safety toe boots but could not pass up this deal. Besides it is not the manufactures fault, just my preference. My foot is a little wide, but I thought I’d take a chance with the regular width. It’s just a little tight. I’m going to exchange for the wider width. It took me forever and a few hundred dollars to find a boot that actually fit my needs. I'm a 14 extra wide. 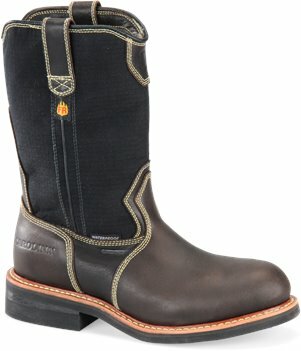 Short of spending $240 every 4 months for Redwings, I found these boots. Spent under a $100 for $230 boots! They have been durable, waterproof, and STABLE on the drilling rig. Thanks Shoeline. I should have bought 2 pairs. nice , well made, water proof, on n off easy, I am ordering a 2nd pair!! Really comfortable boots like them! Now to see how long they last in a welding shop!!! Best boots I've bought in a long time. I have bought my boots from shoeline for many years. I have had great shopping experiences their shipping has always been super fast.